Will in his days on the Holyhead lifeboat. They say “like father, like son”, and that is certainly true in the case of Ivor ‘The Engine’ Jones and his amazing father, Will. 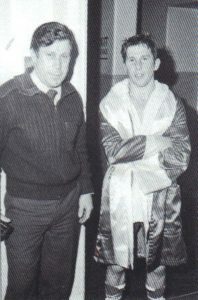 If anyone were to meet Ivor for the first time and they didn’t know anything about him, if they were to watch a film of Ivor fighting men like Billy Hardy and John Dorey back in the eighties with his ferocious and fearless fighting style, if they were to understand how his army of fans would follow him anywhere and fill out any hall at the drop of a hat, people could be quite shocked about that because Ivor is a quiet man who has nothing to prove to anyone. Ivor gets the strong, silent side of his demeanour from Will. Will is the source of where that comes from. 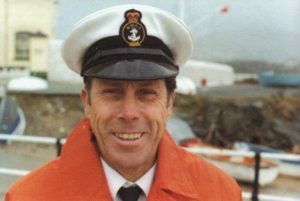 Will Jones was the coxswain on the Holyhead Lifeboat for over 30 years. But, if you ever met Will and you didn’t already know that, he would never tell you about it. My favourite story about Will in this regard is the one where he saved the same man’s life twice in one night. It happened on 2 December 1966. There was a terrible hurricane raging out on the Irish Sea, with the wind blowing at speeds of 100 miles an hour and waves reaching titanic heights of 35 feet. A Greek ship named Nafsiporos was in big trouble off the coast of North Wales. Her engines had failed and she was drifting helplessly towards the rocks with 19 crew members on board. Three lifeboats were despatched to battle their way through those hellish waters to rescue the Greek crew, and Will’s boat was one of them. Nafsiporos was a cargo ship and she weighed almost 1,300 tonnes, so the lifeboats were tiny by comparison. When they found her, they managed to manoeuvre Will’s boat as close as possible to one side of the ship. 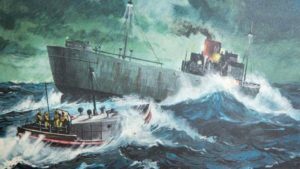 But, by now, a rigid life-raft that had been attached to the side of Nafsiporos had broken away and it was swinging about wildly in the ferocious wind off a single wire. Painting depicting of the Greek ship, Nafsiporos, and the Holyhead lifeboat going to its aid. As Will’s crew struggled against all the odds to maintain their position, members of the Greek crew started to make their way down a ladder on the side of the ship. They had to dodge the swinging life-raft as they climbed down, and they took it in turns to leap from the ladder on to Will’s boat. The first four made it, but the fifth one nearly didn’t make it. Will managed to grab hold of the man and drag him on board, and then Will looked up and he knew that the life-raft was about to come down. Will dived on the man who he had just saved and shoved him clear out of the way. A couple of seconds later, that rigid thing smashed down on to the deck right where the Greek sailor had been standing, badly damaging Will’s boat in the process. Between those three little lifeboats, they managed to rescue 15 of the 19 Greek sailors. Very sadly, the final four refused to abandon ship. The rescue operation took 24 hours, and it has been described as one of the most remarkable in the entire history of the RNLI. Will received a rare medal for his gallantry from the Queen for his part in the Nafsiporos rescue mission. 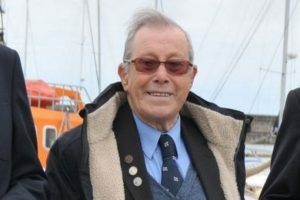 He also met the Queen twice more during his three decades on the Holyhead lifeboat to be awarded further medals for his participation in other epic rescues. But, if you ever met Will for the first time and you didn’t know about it, he would never tell you any of that. Will with his medals that he was awarded by the Queen for his gallantry. However, there is one thing that Will Jones definitely didn’t mind anyone knowing, and that was the fact that his family meant absolutely everything to him. He once told me that, when Ivor went to Newmarket at the age of 15 years old to become a stable lad for the Armstrongs, taking Ivor there from Holyhead and leaving him behind was one of the hardest things that Will ever had to do. He said that going out to face a bad sea was nothing compared to that. Throughout his life, Will was right behind Ivor supporting him in everything he ever did, regularly making the trip from Anglesey to London to be in his son’s corner. Will passed away on New Year’s Eve 2018. He was 91 years old. He was a wonderful husband, a terrific father, and a lovely grandad and great-grandad. Our heartfelt condolences go out to Ivor and his beautiful family at this very sad time. Like father, like son, Will and Ivor.